Find out what your vitamin D and Omega-3 Index levels are by participating today! 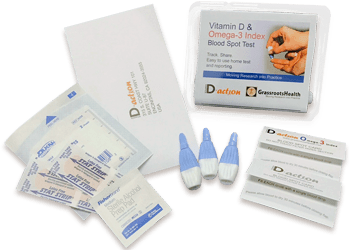 In the privacy of your home you can now check your vitamin D and Omega-3 Index levels together with an easy-to-use test kit. Simply register to enroll and order your kit; the one time combo test and participation is $99.00 plus $5.00 shipping. If you choose to join the 5 year project, there is a $95.00 fee plus $5.00 shipping each 6 months for your test kit and participation. When your kit arrives, provide two blood samples, mail them to GrassrootsHealth, and 7-10 days after receipt back at the office with a completed online questionnaire, your levels will be available to you online. Have you already participated in D*action? While you will need to create a new account by registering in this new system, your previous vitamin D*action data will be combined with the new data gathered as part of the D*action+Omega-3 project when you enter your original ID during registration. You will be given a new participant ID to use on your blood spot cards, and, your vitamin D and Omega-3 index payment process, questionnaire, and results will all be available through this new account. IDENTIFY: You can’t know if your vitamin D level or Omega-3 Index is optimal just because you eat the right foods or take supplements – they both must be measured. CORRECT: Once you know your vitamin D level and Omega-3 Index, they can be optimized with simple dietary and lifestyle changes. MAINTAIN: Testing your vitamin D and Omega-3 Index every 4-6 months ensures that levels stay optimal. Together, we can advance the standard of care to help ensure more people maintain healthy levels of these important nutrients.